Not sure on the protocol of posting a deal with a "not really a deal" disclaimer so posting here (if someone else wants to post as a deal crack on). I came across Beerwulf in a thread on a homebrewing forum. They're based in Netherlands and provide beers from around Europe (possibly further afield, I didn't check) at very good prices e.g. Leffe Blonde 6.6% for £1.09, Duvel 8.5% for £1.39, and various well known beers from Newkie Broom to Tiny Rebel Cwtch, Harviestoun to Chimay. Delivery and customs charged already factored into price. Plenty of testimonies from happy customerd on the home brew forum thread above. If you want to go craft, there's plenty of decent places to get your stuff from. Also avoid Beerhawk - owned by AB Inbev. Owned by Heineken. Avoid.If you want to go craft, there's plenty of decent …Owned by Heineken. Avoid.If you want to go craft, there's plenty of decent places to get your stuff from.Also avoid Beerhawk - owned by AB Inbev. Care to elaborate on why being owned by Heineken equals avoid? Heineken and their ilk are the antithesis of craft. I didn't say anything about craft beers, my interest was piqued primarily by the Belgian offerings, and the low prices. I'm not in any way invested in this site, f you know of alternative that sells Belgian triples from as low as £1.19 I'm all ears (or whatever the online equivalent is). I didn't say anything about craft beers, my interest was piqued primarily …I didn't say anything about craft beers, my interest was piqued primarily by the Belgian offerings, and the low prices. I'm not in any way invested in this site, f you know of alternative that sells Belgian triples from as low as £1.19 I'm all ears (or whatever the online equivalent is). Fair enough, I don't have a problem with macro selling macro. 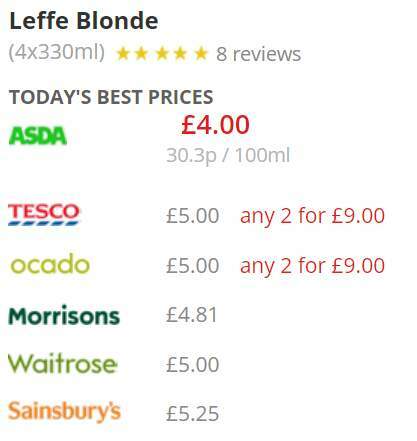 Leffe is on offer at Tesco currently, so nearly as cheap as BeerWulf, worth checking what different supermarkets have to offer but that website has a much better selection. Don't they normally come in a four pack and work out at a quid each? Posting on forums since the beginning of the internet. Idiots.Posting on forums since the beginning of the internet. I love British craft beers too but also the fabulous Belgian brews, Dubbels, Tripels etc. Leffe blonde is readily available in most supermarkets as has been mentioned here but Beerwulf also sell some others such as Grimbergen Tripel at £1.19 and Affligem Tripel at £1.35. Yes these are the 33cl bottles but much higher prices are being asked elsewhere for these brands. I have a brother-in-law in Holland and he told me that some of these prices are cheaper than buying them there. Definitely great value and a breath of fresh air is that you only have to buy 12 bottles to qualify for free delivery. Sold! Is there any update on new discount codes? There should be some very soon and it is ok to share these. Well since my last post in April there have been a few changes at Beerwulf. It seems that they were selling quite a few of those Belgian beers as lost leaders and that has now stopped. There have been some quite startling price increases such as the aforementioned Grimbergen Tripel which has gone from £1.19 to £2.49 although the Affligem tripel is still fantastic value at £1.35. Across the board though, even with the price increases, they are still better value than rival importers such as Beer Hawk and Beers of Europe (who currently sell Grimbergen Tripel at £3.49). They have also put their free delivery threshold up to 16 bottles which doesn't sound too bad but they have recently modified this to free delivery on full boxes only. The box size is now always 16 bottles so no problem there you would think. However what I find a little odd about the full box policy is that if you were to buy a couple of extras making, say, 18 in total, you would get charged the full delivery cost of £4.95 on the two extras. Almost as if you are being penalised for buying more. The only way to always get free delivery is to buy in multiples of 16. Some of the best value is to be found by buying a pre-selected pack. These almost always work out cheaper than buying the beers separately and they are currently applying even larger discounts to a few of them. Also if you sign up for their mailing list you will get a discount code for £5 off. Still a great service and an excellent source of the Belgian nectar in my opinion.